Ocelli--not eyes, but better than nothing. 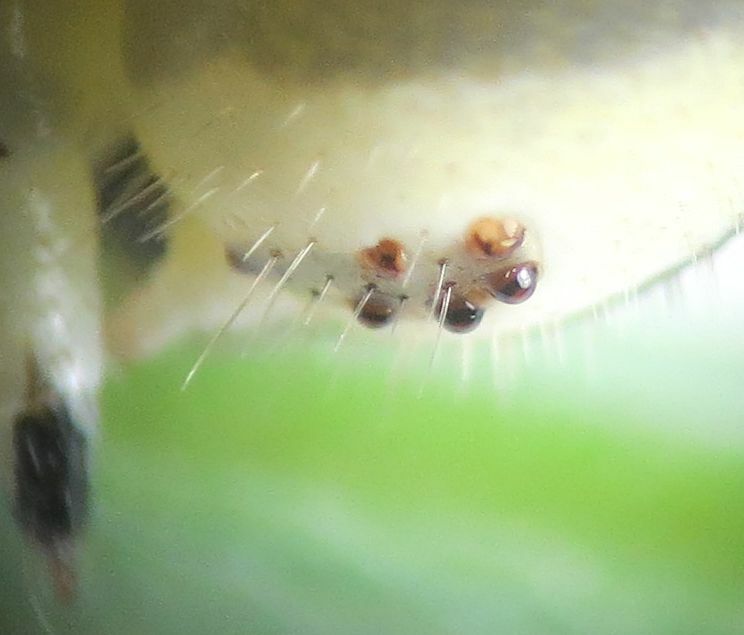 Caterpillars, unlike butterflies, don't have eyes that are capable of forming an image. 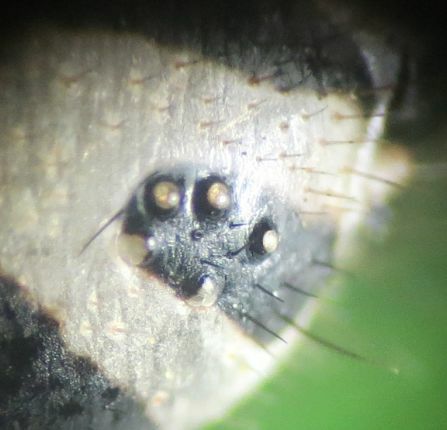 But they do have 6 structures, called 'ocelli', on each side of the head that can sense light and hence presumably allow the caterpillar to tell the difference between light and dark areas. 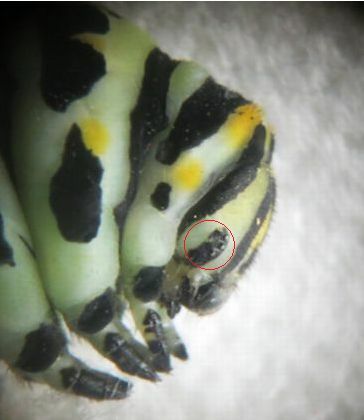 In the final instar (green/black) of Anise swallowtail caterpillars, the ocelli are located in the black pigmented region circled in the image below. This region is magnified below. The bits of yellow crud are fennel pollen. This is a caterpillar in the "J" position on the way to becoming a chrysalis. It's much easier to get a picture of a motionless caterpillar. Below is a "stereo pair" of images to allow seeing the head in 3-D. 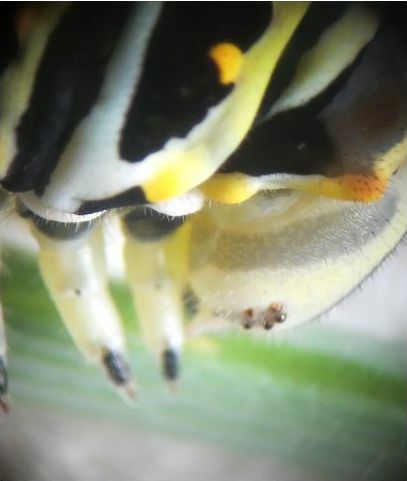 The image on the left was shot through the left eyepiece of a stereo dissecting scope, the right image through the right eyepiece. Gaze at the pair of images keeping your eyes parallel to, and centered on, the images and slowly cross your eyes. As your eyes increase crossedness, at some point you will see a fused single image of the pair widening in the middle of the field of view. Cross your eyes further and the fused image will become complete and will "lock" into place and be 3-dimensional. You should be able to examine the "locked-in" 3-D image without losing the 3-D appearance. If you get dizzy or otherwise find crossing your eyes uncomfortable, stop! Doing this easily and without getting dizzy does require some practice. 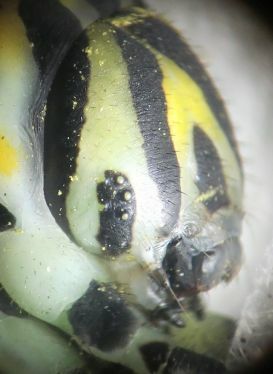 Looking in 3-D at the yellow spot at the left-upper-middle and at the skin just to its right shows the transparency of the unpigmented skin and gives the impression that the caterpillar is a fluid-filled sack. Click here to see the above stereo pair at a larger size. Counting the ocelli in the above images, there seem to be only three rather than six. Below is a better shot showing all six. The red arrows point to the three that may not so obviously be ocelli. 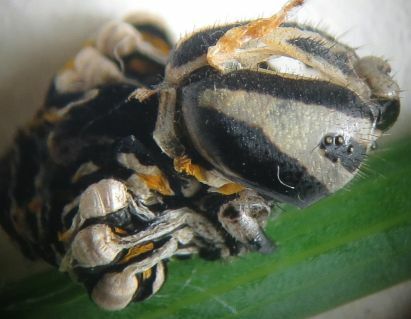 About an hour after the above images were shot, the caterpillar shed its skin for the final time to reveal the pupa. 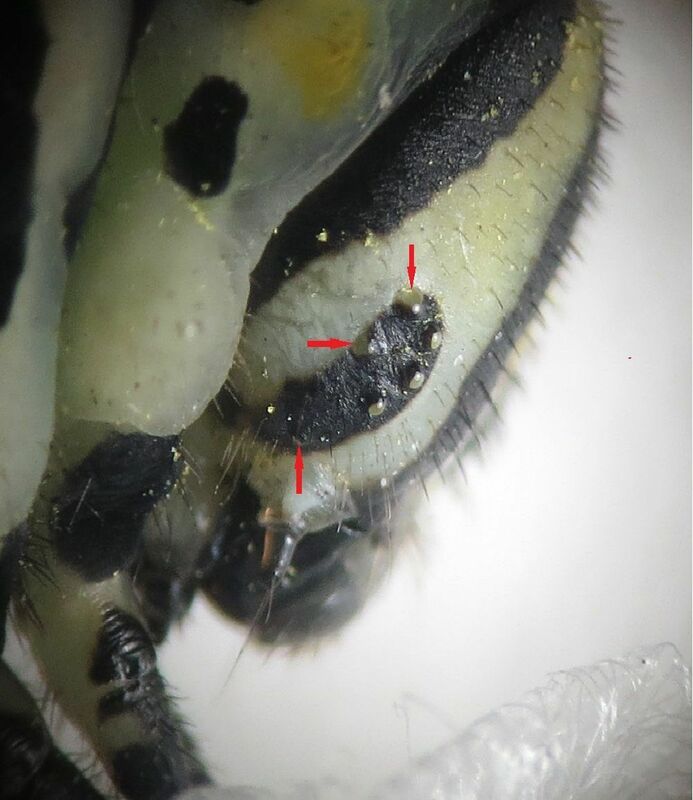 The two images below show the shed skin with its split head capsule, and the magnified ocelli, respectively.